There are two main varieties of heritage breeds we raise and breed on the farm: Red Wattle and Tamworth. The Red wattle has achieved its name from the two small wattles that are attached to either side of its neck. The wattle is a distinct feature to this breed of hog. 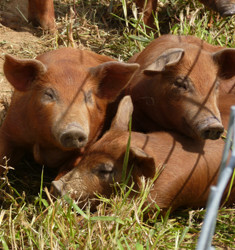 Red Wattles are just an all-around great pig breed to have around the farm. Red Wattles are a livestock breed that have hit critically low numbers and are in conservancy. They are relying on small farms and breeders like us to grow and improve their populations across the country. 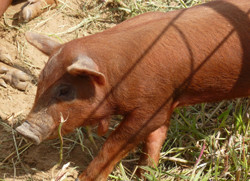 The red wattle is a heritage breed hog which produces a highly marbled very flavorful meat. In fact, Red wattle pork is prized by chefs across the country for its flavor. The wattles ability to forage and take in a high volume of pasture make it a superb pig for our organic pastures and woodlands. Like the Red Wattle, Tamworth hogs are prized for their meat quality. Tamworth’s are a popular breed for raising on pasture for their ability to forage as well as their calm disposition. They are one of the oldest pig breeds known and were originally called Irish grazers. This superb grazing ability lets them put all that pasture into great pork for all to enjoy. Our hogs are given a wide variety of lush pastures and woodlands to scavenge about in. They root up all kinds of roots, insects, seeds and nuts to go along with their free choice organic grains and vegetable crops produced on our farm. We also grow field peas, oats, alfalfa and clover pastures specifically for our pigs to “hog down” the fields while tilling up the soil. All feed is certified organic including pastures, grains, woodlands, and other specially planted crops just for the pigs. We take great care in making sure our pigs have the best and healthiest diet we can give them. No byproducts, no mass produced waste products; nothing other than good, wholesome, nutrient dense feeds and all the pasture crops they will eat. Our approach is simple: healthy, active, nutrient dense soil = healthy, nutrient dense pigs = a highly nutritional, wonderful tasting pork. 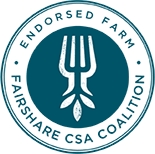 Being an organic farmer who cares about the health of the land, animals, and people served by their products makes animal welfare an important issue for our farm. We use no antibiotics, no hormones, no growth regulators, nothing of the kind. We make sure all feed and pasture is of high quality, water is always clean and present, and there is always fresh grass or forage for the pigs to get to. Providing these high quality items helps insulate our pigs from many of today’s common disease problems. We don’t crowd our animals into messy lots or pens other than for very short intervals while moving them or handling them which greatly reduces disease and pests. We also provide our pigs with organic apple cider vinegar which helps with parasites and immune system protection. Lastly the grass in their pastures is like a giant sponge absorbing many of the causes of disease and stress for the animal and returning a high quality feed in return. The more fresh pasture we give our animals, the healthier they seem to be. All of these factors allow us to keep our animals happy, healthy, and thriving. We always handle our animals calmly and gently without cattle prods or any other devices. All of our processors know that our animals have been and will need to be handled as calmly and gently as possible when the time for processing comes.